As I mentioned last week, our Memorial Day plans were up in the air. I wasn’t sure if we would be going out, dining in with our kids, or having a quiet evening with just my husband. As it turned out our kids ended up joining us. Since I didn’t prepare to serve anything fancy, I pretty much had to wing it. With thinly sliced chicken breasts in the refrigerator, I started rummaging through my cabinets to see what I could create. The weather was beautiful on Memorial Day, it reminded me of the Caribbean with a balmy breeze. 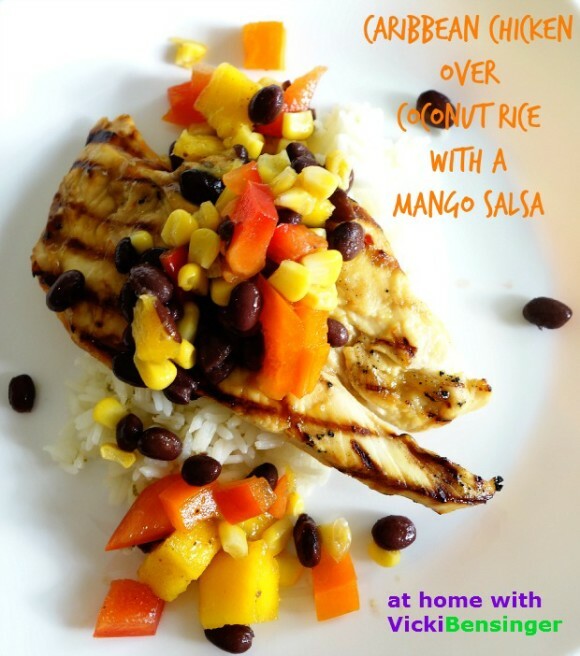 Caribbean Chicken breasts sounded perfect for the day – with that in mind I looked to see if I had anything that could remotely work for a Caribbean dish. Although I’m not much on using bottled dressings or sauces I spotted a Pineapple, Coconut, Mango, Tequila Sauce made by Robert Rothschild Farm – All Natural and Gluten Free. I had purchased this at the store about a month ago when they had sampled it with cream cheese. It was so delicious I decided to bring a bottle home. Since I’d never used it, this seemed ideal to use as a basting sauce for the chicken breasts. I also had a can of Light Coconut Milk that would work perfectly to create some Coconut Rice with a touch of lime. Plus I found a can of Black Beans, a fresh Mango, Corn, fresh Bell Peppers and Limes. My dish sounded like it could be a winner…..so I set off to create it. Everyone loved the meal, in fact, they all agreed I should make it again. 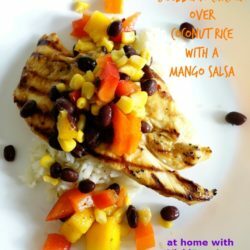 My Caribbean Chicken Breasts with Coconut Rice and Mango Salsa was so tasty, not a speck of food was left on anyone’s plate. Here’s my recipe, I hope you’ll try it…………. Chicken: Rinse chicken and pat dry. Brush sauce over both sides of chicken breasts and place on grill over medium heat, approximately 3-4 minutes per side depending on thickness of chicken. Temperature should register 165F degrees. Rice: Melt butter in saucepan over medium heat. Stir in rice, and sauté 2 minutes, or until rice grains are opaque. Add coconut milk, sugar, salt, lime zest, white pepper, 3/4 cup water, and bring to a simmer. Stir once, cover, reduce heat to low, and simmer 15 minutes. Fluff rice with fork, cover, and let rest 5 minutes. Salsa: Combine all salsa ingredients. Serve immediately or cover and place in refrigerator until ready to use. Best served the day it's made. Plate: Place 1/2 cup rice on a plate, top with chicken breast, and ladle a nice portion of salsa over chicken. Serve.